“Is the door locked?” he asked. The Carter family moved into their new apartment last Wednesday, just as many of us were getting ready for Thanksgiving at home. Jamarius enthusiastically carried in everything that came on the truck from UNITY’s warehouse. 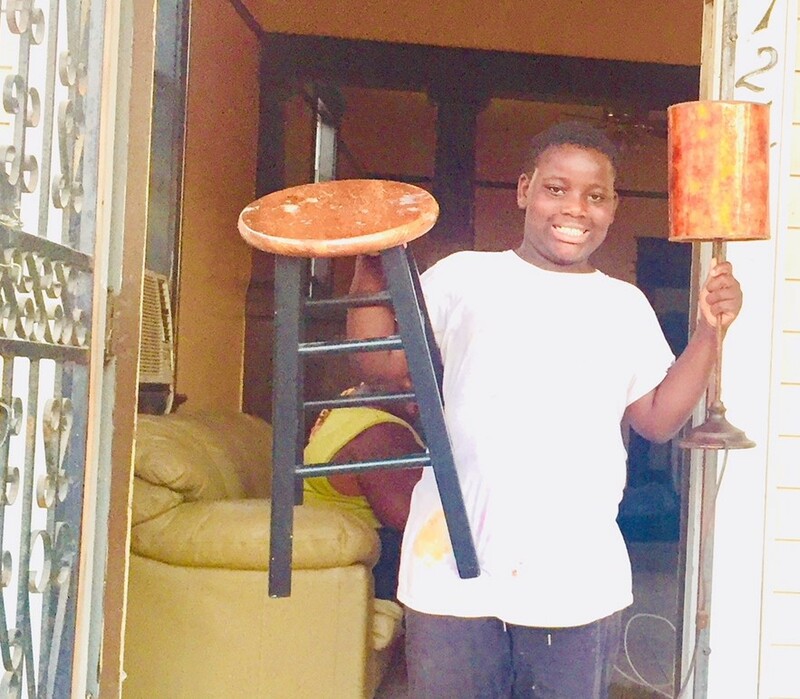 He loved the second-hand lamp and the tall stool, which he hoped to push up to the new kitchen table at homework time. Then he locked the wooden front door and the iron-wrought outer door. Soon he asked his mom to doublecheck his work. “Is the door locked?” he asked. The apartment is a Craftsman-style double shotgun with a newly remodeled bathroom. The family loves it. You may remember from my Thanksgiving letter that Ms. Carter’s younger child, Jamarius, is only 9 years old. His room is in the back of the new house, behind a larger room that now belongs to his sister Heaven, who is 10. Her little brother helped to carry in a lightly used couch. Then he toted a twin mattress and box spring to the back room, now officially his room. He folded a few t-shirts and a school uniform into a two-drawer dresser that had come on the truck. He’d like a theme involving tow trucks and cars on the walls, he said, and maybe a football poster. Then he went to the apartment’s back door, which opens into his room. He checked the door-handle lock and the deadbolt lock. Both were locked. He tugged on the door and deemed it solid. he waved goodbye to the truck’s driver and closed the front door. Click. Click. He locked the door-lock and the deadbolt. Often, he’d wake up in the dark, see the shadows of branches blowing in the wind and check the door locks in the car, he said. There is nothing like having the keys to your own home, with doors that lock. Most children who are homeless feel unsafe and insecure as a result of what they’ve been through. It tugs at our hearts to know that children suffer anxiety from even a brief experience with homelessness. We know stable housing makes a profound difference in children’s lives. And so we are incredibly proud that UNITY’s coalition of organizations has moved hundreds of our community’s most vulnerable people from streets and shelters into apartments. In particular, we’ve worked hard to house families more quickly, reducing the average time children spend homeless here from four months to only 39 days. We find apartments, talk landlords into lowering rents, and provide rental assistance and case managers, who work with families as long as needed, to help them increase income and sustain housing. We are also working hard this fall on the most ambitious campaign in UNITY’s history, called A Home for the Holidays. With your help, we will meet the exciting goal of housing 40 homeless families and 160 chronically homeless people with disabilities in their own apartments by the end of the year. #GivingTuesday is a time for all of us to show how much we care for each other. Please give here to help New Orleans’ most vulnerable children sleep soundly at night, in a stable place with strong locks and soft beds.